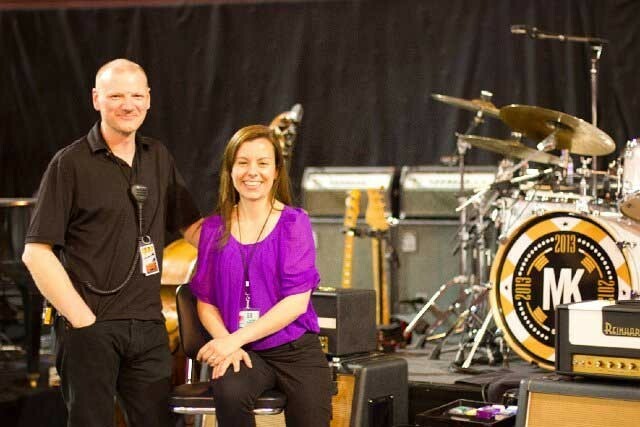 Production manager Kevin Hopgood has been working with Mark Knopfler since 2006 and has developed a strong relationship with Paul Crockford, Knopfler’s manager and his team. With Kevin’s recent move to SW19, it was a logical step for the newly formed production company to take on the logistics of Knopfler’s current tour. This tour has seen some changes of supplier: Entec, with whom Kevin has had an association for many years, is taking care of lighting for the first time, although lighting designer Simon Tutchener and the lighting crew have remained the same for a number of tours. Lars Brogaard’s Major Tom continues to supply audio requirements. “We like to work with smaller companies,” explains Kevin. “Marks’ relationship with people is very strong and very important to the tour, plus we feel we work better with smaller companies. “The most important thing on the tour is audio. It has to sound right above everything else. It looks great too – we’ve kept that very simple and haven’t included any video. Lars has just bought the Meyer Leo system and we think we’re the first arena tour in Europe to go out with it. Dave Dixon at FOH, and Sven Waldheim, the system tech, were keen to work with the Leo, having listened to a lot of different systems. We’ve changed the bass cabinet and the configuration, taking it from a two to a three-box system, which seems to work better for Mark’s type of music, which has an acoustic folk vibe to it in some of the more recent material. To cope with this, the tour has five backline crew: a drum technician, a keyboard technician and three guitar technicians. Transportation is via four Redburn trucks, a company with whom Kevin has a long association. “We’re always trying to find ways of fitting extra shows in, as Mark would rather play a show than not, so Redburn has to be flexible and is heavily involved in the planning stages,” he explains. “We have a bunch of outdoor shows at the end of the tour and, although we try to take production in with us whenever we can, we do also play festivals with local production. The outdoor shows are in locations such as Malta and Sicily, where temperatures can rise to around 40°C, which presents its own problems. In picture: Kevin Hopgood and Lisa Santos.